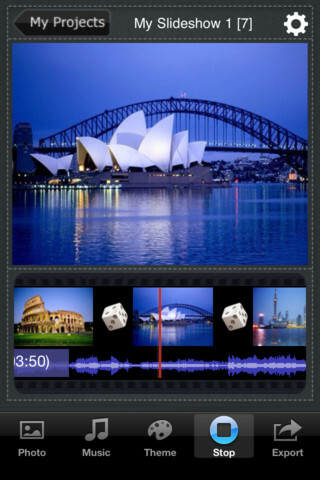 Slideshow+ is an iPhone app that creates an HD slideshow with your photos and music in minutes. This is an iPhone and iPad app that can make you look spectacular with clients, friends, and family, not to mention make you the hero of your PTA. Let’s face it. Those powerpoint slideshows are getting pretty old, and the Slideshow+ iPhone and iPad app brings a fresh perspective to sharing your photos or to a sales meeting. With Slideshow+ you navigate from the bottom of the screen to choose photos to make your slideshow. You can choose photos from your Picasa web albums, iPhoto libraries, and your iPhone and iPad camera rolls. You can also choose to take photos from the Slideshow+ app as well. After you choose your photos, you click the music icon to choose music from your iPod to enhance your slideshow. The next step is to click “Theme.” The theme choices are what transform the disparate photos and music into a high-resolution HD slideshow. You can choose to link the images by zooming and panning them, or you can choose a static theme. The movement of the slideshow can be vertical or horizontal. With a quick click on the wheel icon at the top of the screen, you can set the length of the presentation, the transition time between images, and choose whether or not you want it to repeat. And, that’s it. Your slideshow is complete in just minutes. Once completed, the slideshow is ready for you to wow your friends, family, clients, and prospects. It can be played directly on your HDTV with the proper HDMI cables or Apple Digital AV Adaptor. The slideshow can also be emailed in three different resolutions and uploaded to YouTube. Or, you can simply play it on your iPhone or iPad. The quality of the images and music is incredible considering the simple and quick steps to create your slideshow. The Slideshow+ iPhone app does lack a FAQ or settings menu. I was pleased with the ease in which I created a slideshow; however, I can’t help but wonder if I’m maximizing all of the features. The existing interface of the app is clean and smooth, so it wouldn’t make the app visually cluttered to include more direction. Overall, the Slideshow+ iPhone and iPad app is a great public relations tool for all aspects of your family, school, and work life. The simplicity and ease with which you can set yourself apart from the sea and snooze of ppt makes this an excellent addition to your iPhone and iPad app library. 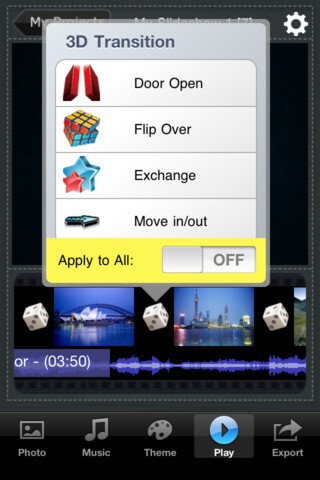 AppSafari review of Slideshow+ was written by Jenni Ward on October 13th, 2011 and categorized under App Store, Free, Photos, Utilities. Page viewed 4743 times, 1 so far today. Need help on using these apps? Please read the Help Page. I would love to use this app but it will not work on my 3g’s … It opens and then just freeze’s – any suggestions?? ?